An overcast and rainy day. Great for the garden, good for photography. In the last post the photo of the entrance to both the Camellia Walk & Circle of Friends was not clear so here are some taken today. the walkway that leads to the Circle of Friends. 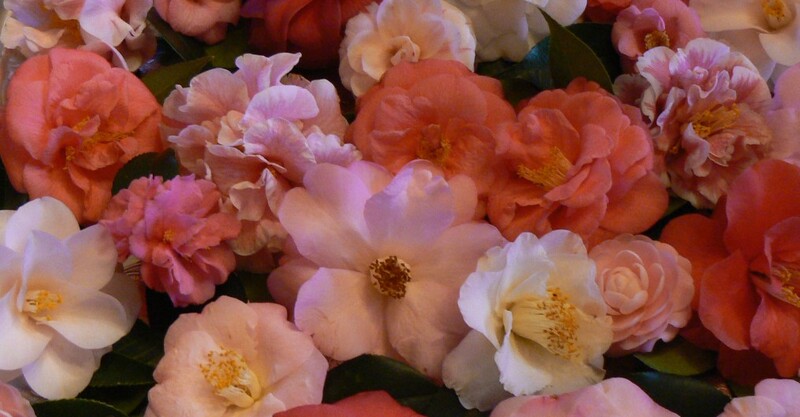 Note that the pink flowering camellia plays a role in both garden rooms. The east side of The Circle of Friends, punctuated by variegated boxwoods (Buxus sempervirens ‘variegata’). This space is actually oval in shape. All the plants in this little garden were gifted to me or were cuttings from the gardens of friends, hence the name. It is encircled by camellias (as background structure) and hydrangeas. On the west side, the structure of camellias is the back side of the Camellia Walk. Like most areas in the garden it is unfinished however, what I plan can be found here. This is marked by the interesting texture of four upright Japanese Plum Yews (Cephalotaxus harringtonia ‘Fastigiata’) and underplanted with variegated Japanese Sedge (Carex morrowii); the idea being to tie in the variegation and create an ‘Elizabethan Collar” around the yews. If this path is followed further,one gets to the Potager. We have been walking north. Below, the view from the north looking south back through to the meadow. The repetition of the Variegated Box & the Carex create rhythm and serve to tie the sequential spaces together into a coherent whole. This entry was posted in Camellias, Garden Design, Garden Rooms, Hydrangeas and tagged camellias, garden design, garden Rooms, hydrangeas. Bookmark the permalink. I love a rainy day and luckily, it’s rainy here too! Garden is looking beautiful as always! Your garden is amazing and inviting Sandra! I like your wrought iron chairs and the pink camellia. Have a great day! Dear Sandra, As you show here, it is so important for a garden to have a narrative. That is to have a beginning, a middle and an end and to always be drawn purposefully through the whole. Your developing garden is certainly staying true to that principle and seems to be maturing well. Already you have areas of mystery which are discovered as plants begin to screen the view. Lovely! Wonderful tour even with the weather as it was…love your explanation and Elizabethan Collar effect is amazing.